One source ("Doc X") places this book on one day, Jan 21, 1968 in Bombay but really, one cannot imagine such a day. At best this is one date of many. Various sources have from twelve to seventeen discourses in this series. It seems reasonable to suppose that there are seventeen original discourses but because of poor sound quality much has been lost and compacted into twelve chapters in the e-book, which is the nearest thing we can find to hard copy. TOC below reflects info from two audiobook offerings. Titles line up fairly well when missing discourses are ignored. Those discourses in one but not the other were specifically noted as having poor sound quality. One of the titles missing in OW's collection is, interestingly, used as a title in the e-book, one of the few titles that appear there. (And no date and place info either, alas). 12: क्या भारत धार्मिक है? 17: क्या भारत को क्रांति की जरुरत है? 8. क्या भारत धार्मिक है? 13. क्या भारत को क्रांति की जरूरत है? Dates and Places image in from Jagdish illuminates a part of the picture regarding D&P. Text version below. The inclusion of two fragmentary infobits relating to Sakshi Ki Sadhana (साक्षी की साधना) and Sakshi Ka Bodh (साक्षी का बोध) perhaps can best be viewed as a distraction. More on that below. 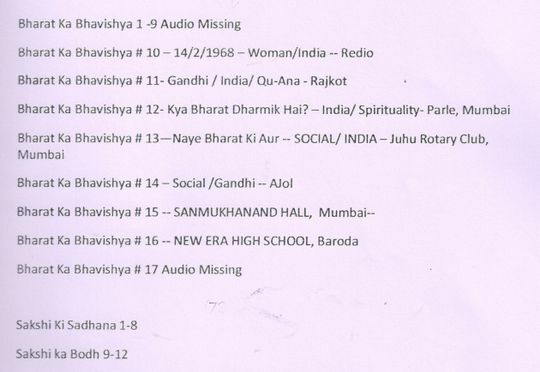 Note that the transliterated titles given for ch 12 and 13 (see image) resonate well with those in osho.com's audiobook. Regarding Sakshi Ki Sadhana and Sakshi Ka Bodh, these two "series" already have a complicated relationship with each other and with other series, so this image may or may not add a further layer to all that. Perhaps the most important thing to remember here is that both the Sakshi's are "spiritual-themed talks with roots in meditation camps, while Bhavishya is decidedly social-themed, with talks not given in camps. This page was last edited on 3 March 2019, at 08:12.